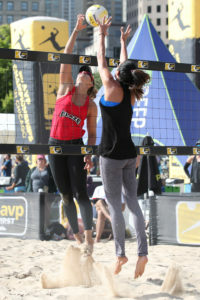 Blaze365 is proud to welcome back Kerri Schuh, an AVP Pro Beach Volleyball player! This is truly an amazing opportunity for volleyball players to train with a PROFESSIONAL volleyball athlete! Kerri is from Kaukauna and played college volleyball for the University of Wisconsin – Milwaukee. Kerri played professional indoor volleyball and then transitioned to professional beach volleyball. She knows what it takes to excel on the court and in the sand! We are offering FOUR Practice with a Pro! Volleyball Clinics this summer! Each clinic will be 3 hours and will focus on passing, serving, setting, serve receive, defense, blocking, aggressive play at the net, hitting, and game strategy. Click HERE to register! **REGISTER by 6/15/18 and receive a FREE T-Shirt! Click HERE to register! **REGISTER by 7/25/18 and receive a FREE T-Shirt! *Each training session will be limited to a maximum of 20 athletes. One on one training is available with Kerri on June 29th, August 8th and August 9th. Email schedule@blaze365.com to schedule a 60 minute session. twice named the Horizon League Player of the Year in 2010 and 2011, AVCA Honorable Mention All-American, and AVCA All-Region. Kerri played professional indoor volleyball for one year in the PVL (Premier Volleyball League). She competed for the Wisconsin Badger Blizzards team during the 2012-2013 season. When Kerri is not playing, she shares her knowledge with the youth. Kerri has helped develop many college-bound and college hopeful beach volleyball athletes along with teaching the basics to the youngest of generations. Kerri gained collegiate coaching experience as an assistant at Wisconsin Lutheran College for the 2012-2015 indoor seasons. She also started a business centered on giving private and group volleyball lessons. In 2015, Kerri fully committed herself to the outdoor game. She moved to California to surround herself with the best resources and competition. She played her way into 5 professional events, with 7th place as her top finish for both 2015 and 2016 AVP beach seasons. Kerri continues to work towards her goals which include: becoming a top player on the AVP tour and establishing herself on the world tour. She’s also got her eye on the 2020 Olympics! On her journey, she wants to give back to the younger generations in hopes to help more dreams become a reality.